Bogong staffer Mark heads south in search of adventure, tackling the popular Overland Track in Tasmania with the added challenge of winter conditions. 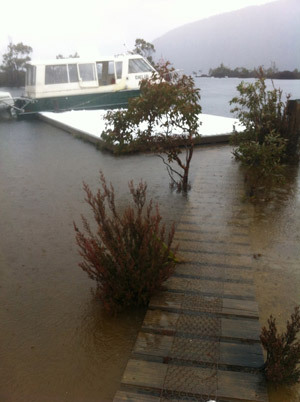 It was not an auspicious beginning: Before I had even begun the Overland Track, I was taking my boots off to wade through shin-deep water; the jetty at Narcissus Hut was submerged. No matter, I was soon off into the journey, with 10 or so cm of snow from the morning, and a light drizzle to soften it up so it could get into my boots. It's not far to the Pine Valley turn off, and then up to Pine Valley Hut, but with a backpack with a week's worth of food, full winter kit and snowshoes/axes/crampons, it was slow going, and for the last fifteen minutes along the board walk to Pine Valley Hut, I needed my headtorch. The plan had been to make my way up onto the Acropolis and traverse Mt Geryon and the Du Cane Range to Mt Massif, then over to Falling Mountain, before dropping back to the track near Du Cane Gap. But it rained all that night, and in the morning, the visibility was OK in the valley, but looked atrocious up top. 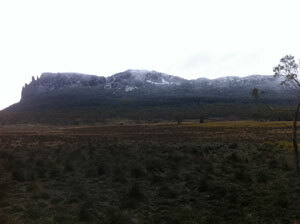 So I went back out into the rain, and onto the track towards Bert Nicholls Hut. Around lunchtime, the sun poked through the clouds, and then cleared all across the Du Cane Range, and I kicked myself for not committing to the traverse that morning. But as I arrived at the hut in the early afternoon, Mother Nature proved me right as the heavens opened up and it rained hard all afternoon, finally turning to snow as it got dark. It was a glorious walk up to Du Cane Gap the next morning, with 10 to 20cm of snow blanketing the landscape, and a little sun occasionally coming through the clouds. The snow seemed to energise me, and I made good time up to the Gap, a spectacular spot between Falling Mountain and the Traveller Range, and the Narcissus and Mersey Rivers. The track loses height quickly down the other side, and soon I was walking through a dripping and wet Myrtle-Beech forest, with a little wet snow still in patches. Most of the track was under a few inches of water here, and, though I never needed to take boots off, my feet were constantly wet. Finally I came out of the forest at the historic Du Cane Hut, where I stopped for a block of chocolate and to wring out my socks, before pressing on to Kia Ora Hut in time for a late lunch. That afternoon it rained again, and I happily whiled away the afternoon by penning a crossword in the logbook. The following day, my fourth so far, I hoped the weather would clear at least some, so I could try to climb Mt Ossa, Tasmania's highest. And indeed, I awoke to the first real sunshine I'd had, with spectacular views of the Mt Massif-Falling Mountain Range and the bulk of Mt Ossa's many ridges, spurs and lesser peaks. I packed up quickly and made good time up to Pelion Gap, with two firsts along the way: taking my jacket off in the heat of the sun, and putting snowshoes on for the deepening snow near the Gap (1123m). Here I left my backpack, stocking my pockets full of scroggin and slinging my axes and crampons on my back, and continued on up, through deep, softening snow (the rain from yesterday had fallen as rain all the way up to the top, so the snow was very deep, unconsolidated, and soft), around Mt Doris, and then up Mt Ossa itself. The climb goes up a steep spur, around 50 degrees, which was deep under snow, deep enough to warrant the snowshoes, but steep enough for me to wish I could use crampons. Finally, after wallowing up this for sometime, I reached a small shelf, and traversed under some impressing dolerite cliffs, a very exposed and exciting spot, with wonderful views back towards Mt Massif and the Du Cane Range. 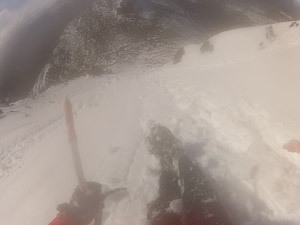 There is then a final couloir to climb, up between some big cliffs, from where you can gain the final summit plateau. 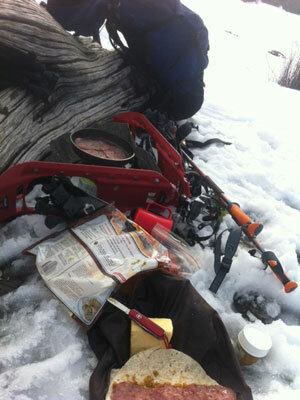 Here I swapped the snowshoes and poles for sharps, and, now pointy on all limbs, felt a lot more secure. But higher up, the snow didn't get any better, and I was driving my axes into the snow all the way up to the picks, with no resistance, and no security. It was like climbing a 60 degree slope of porridge. I felt I could make the moves over some sketchy sections of ice and rimed up rocks, but was worried about the wet snow that was cascading down the couloir from above, and that later I would have to downclimb the same section, which I felt less certain about. So, spitting distance from the summit plateau, I made the call and began the descent. 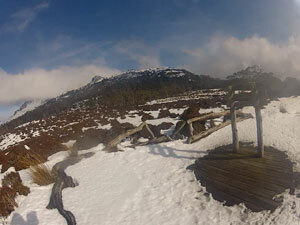 Once back at the shelf, I made good time, glissading on my bum down the snowy spur towards Mt Doris. 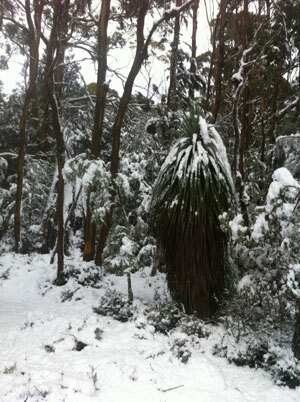 I was back at my pack by lunchtime, and at Pelion Hut by 3:30. 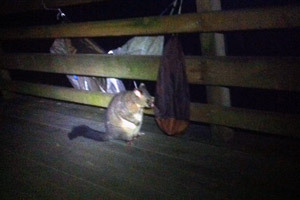 It was still delicious and sunny, and the decking faced west, so I pulled everything out of my backpack, and stripped down to my thermals, and hung everything out to dry, and I sat in my sleeping bag, cooking dinner and shooing away curious possums, drawn by the smell of my drying boots and re-hydrating beef casserole. I took MSR Evo snowshoes, which were useful for Pelion Gap and Mt Ossa, and the final day walking out from Scott Kilvert Hut, but they were probably only used for 3km in total, which isn't far when you have to carry them for the rest of the journey. 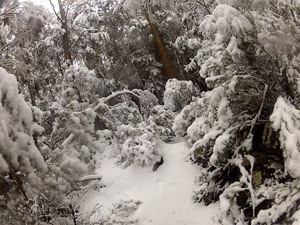 But I think that for a winter traverse of the Overland Track, they are necessary to take because the snow conditions are so difficult to pick. I bought Mont PowerDry thermals a few weeks ago, and was interested to see how they would perform in such wet conditions. And they definitely came through. I literally did not take them off for the seven days, and they were often getting wet around the wrists and especially ankles, but they stayed incredibly warm when they were wet and took no time to dry out each evening. Definitely a piece of kit I would highly recommend for anywhere wet and cold. I also had a Mont Neon down jacket, which was lovely and light, and great to have, but perhaps not quite as warm as I would have preferred. A down jacket would be a must, but something a little warmer would have been ideal. Likewise, I did not take any fleece pants, but these would have been very nice to be able to put on in the evenings in the huts. I used the Mont Highland, which was also a new purchase, and I was very impressed at how light it was, and how warm it kept me. I could wear wet clothes to bed and the down didn't seem to get wet at all (it's DWR treated), and kept lofting up really well. I used the Rab Latok jacket, which was brilliantly waterproof and durable against all the trees and bushes that were bent over the track with the weight of snow on them. I also had Mont Austral pants, which have long been my go-to pant for wet weather bushwalking, and these worked as they always do – perfectly. My Asolo Flames, which I've had for a few years now, and are nice and worn in, were very comfortable, but it appears the Gore-Tex has worn out. Drying boots out every evening was futile, as I was worried about the glues splitting if they were too close to the coal heaters, and most evenings they were just too soaked to dry anyway. And within ten minutes the following day, they'd be wet through again. So I became quite zen about having wet feet, and don't think there would be any boots out there that would keep your feet 100% dry, except for perhaps a full grain leather. Each morning, I would wring out my socks (Bridgedale Trekker, which were comfortable and warm as always), put them on, and then put my wet boots on, and as soon as I begun walking, they'd warm up. Sea to Summit Hut Booties were very nice and warm to pad around the huts in each evening, and, with a rubber sole, dry enough to go to the loo or collect water even with snow on the ground. Also my Black Diamond Traverse poles, which, strictly speaking, are ski poles, but they were great to have for the entire walk. Slippery tree roots, narrow board walks covered in snow, boulder-hopping across creeks, they were great to aid balance for most of the walk, and certainly a helpful boost on the long uphill and as an extra brake for the downs. During the night, the wind picked up and it poured torrential rain, and when I woke I was unenthused about the day ahead, and walking in this heavy rain. But during breakfast the rain turned to sleet and then to snow, and so by the time I was ready to leave, Pelion Plains were dusted in a coat of wet snow, and the weather began to clear as I left the hut. By the time I'd descended to Frog Flats, the sun was out, and the snow had melted off, and it was a wet walk through the forest, skirting around Mt Pelion West, until, a few hours later, I climbed up above the treeline and onto Pine Forest Moor. It was cold and windy up here, and as I stopped for bite to eat, it began to snow again, at first wetly, but it soon got colder, windier and heavier, and before long, was a blizzard. I continued along, up through some trees, then back onto the Moors, not stopping for lunch, just keen to get to Windermere Hut. But it was pleasant walking still, my clothes were working, and I was warm and dry, and it was wonderful to be out in such a wintery landscape. Mid afternoon saw me arrive at the hut, where I had another cold night, with more rain and wind overnight. In the morning, the rain didn't let up, so with a sense of foreboding I packed up, and wandered out into the weather. 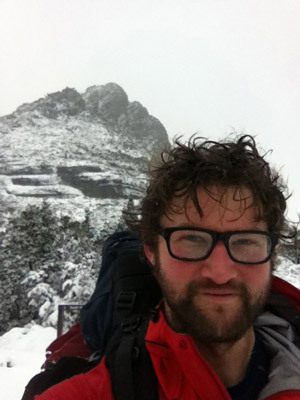 It was wet and miserable, raining heavily, and windy crossing the open grassland above the treeline. I made it to Waterfall Valley Hut without incident in time for lunch and thought about my next move. I had a few days still before I was due out, and considered waiting there for the weather to get better, so that I might be able to climb Cradle Mountain or Barn Bluff. But the weather seemed to be getting worse, and it would be a boring old wait in the hut, and there was no certainty that the weather would get any better. 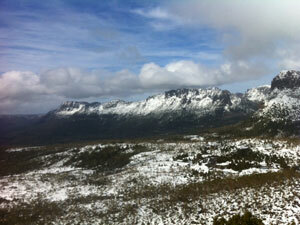 And there was a bus running the next day which I'd be able to ride from Cradle Mountain to Launceston. So after a lazy lunch, listening to the rain and the wind outside, I packed my stuff again, and ventured on. Up on Cradle Cirque, I was well and truly in the elements, the wind whipped at my clothes, and hard snow stung my face. Up here there was patches of deep snow, deep enough that I was tempted to use my snow shoes, but infrequent enough that it was not worthwhile. 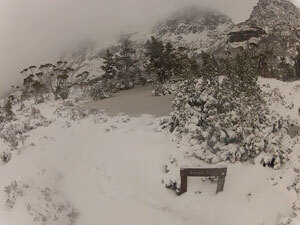 So I stumbled about, post-holing through knee deep snow, and being buffeted by the wind, to the turn off to Scott Kilvert Hut, where I'd drop below the trees again, and around the back side of Cradle Mountain, and so out of the wind. It was a steep descent, with lots of water on the track, but soon I was down at the hut, where I rolled out my gear for my last night out. Overnight it snowed 15 or cm, and the world was a beautiful wintery wonderland. The track here traverses under the south face of Cradle Mountain, to near Dove Lake, and it was spectacular walk with deep snow covering everything, and long slog up to the pass above the lake. I was disappointed to not be able to do the side trips I'd wanted – the Du Cane Range, and Cradle Mountain, but was happy with the decision to call it early and head home, and was pleased that I'd seen the track in all it's wintery beauty. Above Dove Lake, I walked along the snowy ridge, in the windiest of weather, and finally made my way back down to Dove Lake and the parking lot. That afternoon I was eating hamburgers in Launceston, and was able to pull my flight forward, and was home in Melbourne early the next day. It had been a long and difficult walk, but lovely to see it in such wintery conditions, something I'd wanted to do for a long time, and a very satisfying trip.